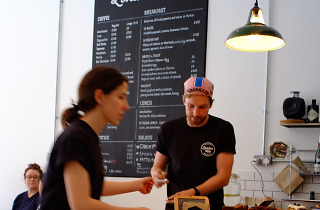 A bike café in Deptford, with a mechanic on site and good, simple food and drink. Okay. Let’s put this on the table, then get it cleared away. London Velo will be seen as evidence of the G-word. To be fair, Deptford has supposedly been in the throes of ‘gentrification’ for so long that you wondered if the gents had just gone somewhere else. 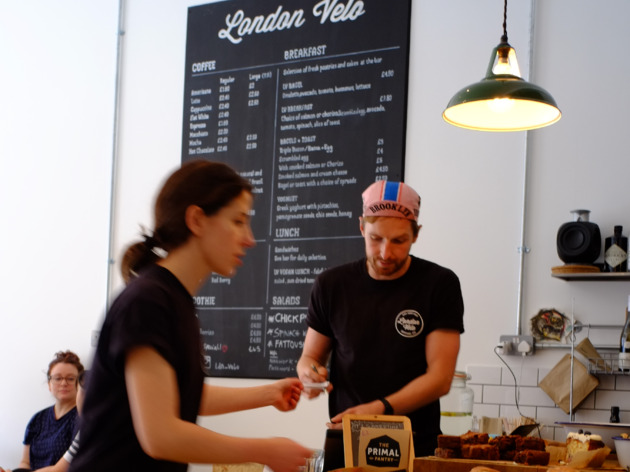 LV is a bike café that does a few simple things very well: coffee (from Union Coffee Roasters), cooked breakfast things, bagels, cakes, bike-fixing (they have a mechanic on site, and he was beavering away the two times I visited). It has Meantime beer and will bring you a pizza from The Big Red Bus round the corner in the evenings. It caters for vegetarians and vegans, has a friendly dog and the staff are lovely. It’s hardly revolutionary in London in 2015, but it sticks out on Deptford High Street like a sore thumb. I can’t feel too guilty about this. There’s clearly demand: it’s busy all the time, and the High Street is hardly blessed with great places to eat, unless your diet consists of little pens from bookmakers. Plus, in the dozen years I’ve lived in or near SE8, I never set foot in whatever preceded it on this site and I can’t remember what it was. So yeah, I like it a lot. Does that make me an oppressor? Maybe. But at least I’m an oppressor who’s just eaten a delicious bagel. Meal for two with coffee and service: around £20. Pros: very good quality coffee; lovely staff; open late; if you love dogs there is always one around, and at the same time it is a real bike shop - those bikes hanging from the ceiling are not a decoration; good for working (free WiFi). Cons: it gets cold inside in winter; they could fit some additional tables, there is definitely enough space. All in all: one of the best coffee shops in SE. Must visit when in Deptford. Amazing coffee, and the tastiest bagels. Perfect for working and meeting people. Brilliant value too! Great coffee, friendly, no fuss place. Contemporary and cool. If there's nothing wrong with my bike I still bring it in for some live while I enjoy the best latte this side of Rome. Fantastic coffee, vegan breakfast & staff! Great DJ nights on a Saturday evening. Much loved & needed cafe/bar in the area. I tried this place as I live locally and I must say I was not impressed. Food and coffee not noteworthy and shockingly expensive. As are the bikes! Faux-Neukölln ambience, charmless staff. Adds very little to a high street that already gives so much. Sophie, Steve (and Maurice) have done something amazing – a home away from home. The coffee is ace, the space is great and there's good vibes all round. Delicious bagels and smoothies! I am sort of addicted to them... And the French bulldog is such a cutie! Lovely cafe, good vibe, decent coffee. Better still, the bike mechanics are helpful and friendly and repairs to my bike were both reasonable and well executed. How did I manage without you?